Atlantic Salmon Flies: Farmington Frog Gurgler - aka "Bluefishing for Trout"
Farmington Frog Gurgler - aka "Bluefishing for Trout"
"What are you fishing for, bluefish?" That was one of the snarky questions I was asked the last time I fished this fly. It was nearing sunset and I was targeting aggressive brown trout. These particular trout weren't interested on feeding on insects like their smaller brethren. After ten minutes of casting, a large brown boiled at my Gurgler Frog. A few minutes later, I had another vicious rise. "You see?" I replied. "Sometimes these picky trout actually go after stuff like this." "They're probably not interested in eating that fly. They're probably just trying to get it out of their territory." ...but I didn't say it. At one time, I wouldn't have hesitated. Now, I'd just prefer to be left alone to fish, waste my time, disturb the pool, or whatever. The truth is, the Gurgler Frog doesn't always work. It doesn't even work most of the time. Obviously, it's no Prince nymph or Parachute Adams. But when it works, it is FUN. When trout decide that it's frog time, it's probably the most fun I have while trout fishing. When it's really on, I guess it is like fishing for bluefish. I've had afternoons where cast after cast was met with explosions from good sized brown trout. Most rises don't result in a hookup, which probably gives plausibility to "territorial aggression" hypothesis. Sometimes I do hook up, though. Whether or not they eat the fly, the extremely volatile rises are entertaining enough to keep fishing the frog pattern. I find the Farmington Frog Gurgler most effective at the beginning of the season, when trout are just starting to rise to the surface for hatching insects. I discovered that it works well when an afternoon Hendrickson hatch is winding down, but before the spinner fall starts. I've also fished it during the Hendrickson emergence and have caught large fish who weren't interested in rising for insects. A Hendrickson spinner fall is too good to pass up, so I usually go back to dries when that happens. Another good time to fish this (or any other Gartside Gurgler pattern) is right before sunset. The trout let their guard down and can be willing to throw caution to the wind. To my surprise, I haven't had much luck with Gurglers after dark. I try to make as much commotion as possible, which means that it probably shouldn't be fished in close proximity to other anglers. I make it land with a big "Splat!" Then, I throw a big upstream mend and pop it across stream, letting it pause for a moment between pops. The strikes usually happen while the fly is resting, though I've had browns chase it clear across a run while I stripped it quickly. As always, it pays to experiment. 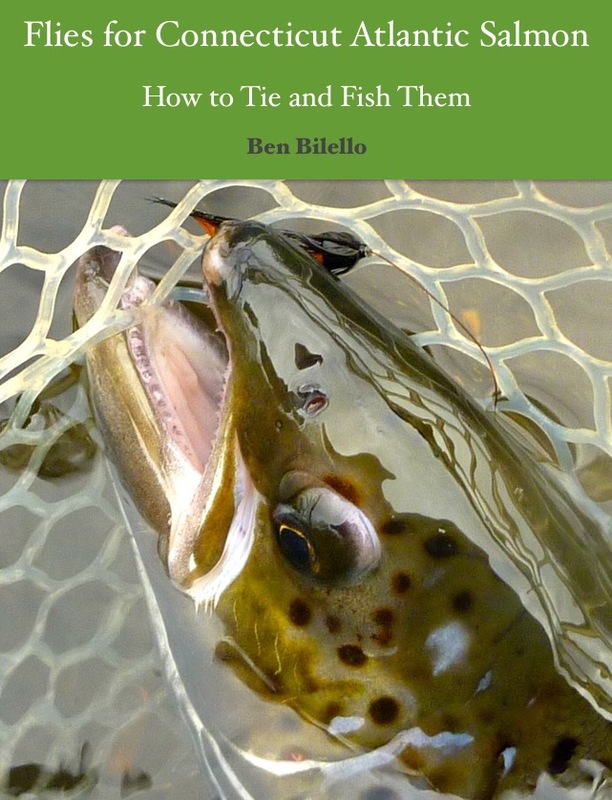 Is it the best way to catch trout? Definitely not. Might it offended the delicate sensibilities of purist crowd? Possibly. Will fishing it make you look like you're a little off your rocker? Probably. Is it a really fun way to catch trout? Hell yeah! A trout caught by Ron Gaul on opening day 2015. 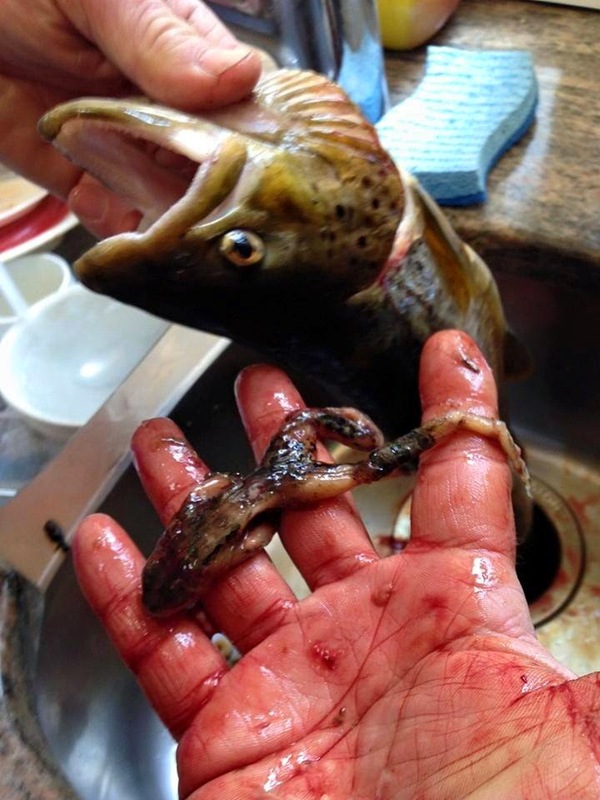 Proof that trout eat frogs! Love it! Make up a few in smaller sizes for small streams, brookies eat them too. :) Also, I fished at the end of the day yesterday at low tide and had a small salty brown take a swipe at my white UV bugger. River was ripping down there, needs to come down a bit. I fished the outgoing tide at a local river last week, but no dice. At least you had a little action! I think the action will start to heat up at my favorite spot in two or three more weeks. Good luck! I still laugh every time I think of that evening on the Farmington when you were stripping those things across the water. What a show!